After graduating from Makerere University in his home country of Uganda, Kamya was inspired to go abroad to learn about the technologies used in America. “I want to set up my own tomato greenhouse back in Uganda in the future so I needed the hands-on experience and to learn about the latest technology to help me achieve my dreams,” Kamya shared. 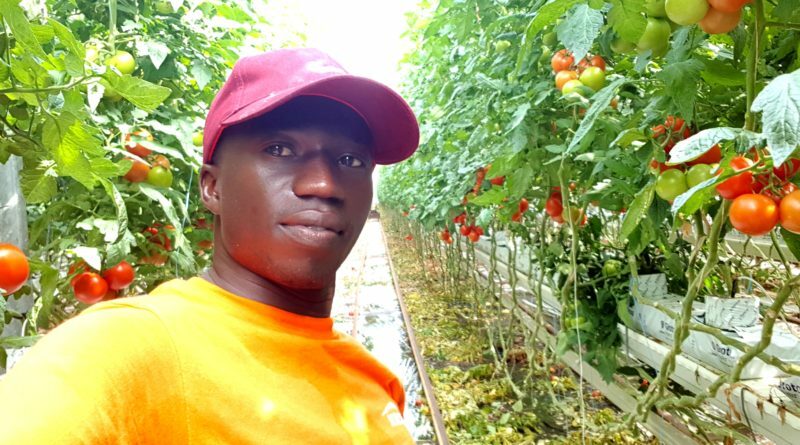 I am training at Intergrow Greenhouses and I am living with other international exchange trainees from all over the globe including Jamaica, Netherlands, Malawi and Vietnam. My host is a loving and caring man who is always smiling and ready to teach us, every day. I have learned how to grow tomato vines, how to work with different fertilizers, how to install and operate irrigation pipes, and much more! My favorite part about the United States is how diverse the culture is. People from the United States have warm hearts and are so welcoming and lovely. I learned that American people will never pass one another without saying hi, which is really different from my country! I also noticed people in America love giving and helping when people are in need. It is truly the land of opportunity.. and I really enjoyed the burgers, too! During my experience, I had the opportunity to travel to Niagara Falls and Lake Ontario. It was a dream come true to visit Niagara Falls! I remember when my teacher taught us about the Niagara Falls and how all the photos looked amazing. I knew at that point that I wanted to go to Niagara Falls. I thank CAEP for bringing me to the USA! During my time on my CAEP program, I have been exposed to state of the art technology that goes beyond my wildest dreams and I have made friends not only at the greenhouse but also in the sweet community of Albion where I live! CAEP exposes you to state of the art technology, new skills, a new culture, and gives you the opportunity to learn by doing! I would strongly recommend the CAEP program!